You would think this is a pretty stupid question. Aren’t all things the price they are because of basic supply and demand? Normally that answer would work as a satisfactory explanation, but the prices of ebooks don’t seem to make sense in a lot of cases. The Salt Lake City Public Library in Utah found out that ebooks are more expensive than print books. They offer thousands of ebooks to their patrons through OverDrive. Their conclusion was that ebooks cost roughly eight dollars more per copy than physical books. A quick trip over to the Amazon Best Sellers books list shows the paperback version of “The Hunger Games” as the #1 print book for $5.39. If you go to the Amazon Best Sellers Kindle books list, you find “The Hunger Games” as the #1 ebook for $7.49. So the best selling ebook on Amazon is $2.10 or 38.9 percent more expensive than the physical paperback copy of the same book. How can that be? Don’t ebooks cost less to make than paperback books? There are no printing or shipping costs for ebooks. All you have to do is make sure it’s formatted correctly, test it on a few ereaders, and send the file off to all the retailers that you want to sell it. Ebooks should cost less to make than print books. How is it that they cost more at the store? The answer lies in print books. Print books have an established business model that has existed for a very, very long time. The traditional book publishers have controlled the flow of books to bookstore shelves essentially forever. The publishers would screen potential books and provide advances to potential authors. They would act as the gatekeepers to the customers that authors so desperately wanted their books to reach. Bookstores loved the publishers as they worked as a filter for all the books that wouldn’t sell well. The entire system worked for decades. That system rewarded the book publishers very well. They were the most valuable party in the bookstore, author, publisher equation. As such, they received the lion’s share of the reward. Authors make somewhere between 5-15% of the retail price of their books. Bookstores make 10-15% and the rest goes to the publisher. The printing and shipping costs are somewhere around 10%. So how does that translate into ebooks costing so much? At the very least, shouldn’t ebooks cost 10% less since there are no printing and shipping costs? The answer lies in self-publishing. Book publishers are paying higher royalties on ebooks because of self-publishing. Authors can easily self-publish their ebooks at Amazon, B&N, Apple, and others. Authors that choose to self-publish get 35-40% of retail for ebooks priced below $2.99 and 65-70% of retail for those priced at $2.99 or above. Self-published authors get to keep 70% of the retail price of their ebooks if they choose to self-publish. This is massively disrupting the control that the book publishers have had for decades over authors. This seismic disruption in control is causing the royalties that publishers are paying for ebooks to be way higher than they pay for print books. A typical publisher will pay around 25% of net or 18% of the retail price for an ebook to the author. This is much higher than the average of around 7.5%-10% for a print book. This is a very large factor in why ebooks are so expensive. Book publishers treat ebooks like print books with 10% lower production costs. To them an ebook is no different than a print book. Both are simply a copy of an author’s work that publishes with them. If you sell a digital copy to someone, it means that they will not buy a physical copy. They just care about copies sold and the price that they are sold at. They control the prices and they want to make sure they don’t lose money if they sell a digital copy instead of a physical one. Assuming 10% less in printing and shipping costs, a publisher could set the price of an ebook 2.5% lower than the print book and still make the same profit. This assumes a 10% royalty for the print book and a 18% royalty for the ebook. Obviously, these numbers vary from publisher to publisher and from author to author. 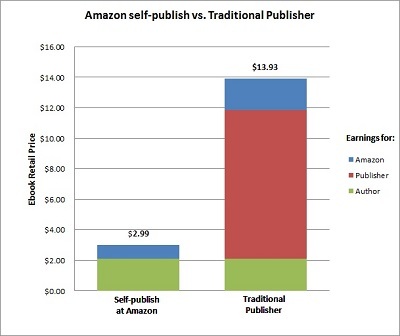 At only 2.5% though, it’s easy to see that publishers don’t have much flexibility on their ebook pricing if they want to make the same profit per copy. So book publishers still have a great deal of control in the marketplace for books, but they are losing that control due to the self-publishing of ebooks. As such, they have to pay out a greater percentage of ebook revenue to authors to be able to sign them up. This along with the book publishers trying to maintain (or grow) their revenues is the main reason ebooks are so expensive.